I love this light, it is perfect for our bathroom. It is not too bulky and actually lights the room perfectly since the lights point down instead of straight on. 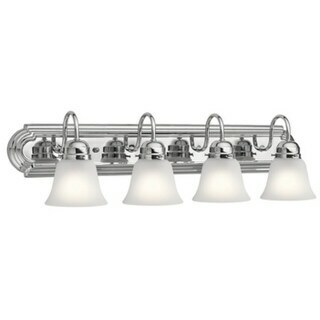 This 4-light bath/vanity light features a chrome finish that will complement many traditional decors. Clean lines of the steel frame add interest while satin etched glass shades soften the light to create a warm ambiance for any bathroom or vanity space. Beautiful Chrome finish with contrasting Satin Etched glass shades. Dimensions: 8 inches high x 30 inches wide x 8 inches deep. Turn on our fixtures, and watch your room transform even more. From lighting to ceiling fans Kichler collections are built around our simple philosophy of bringing you the effect you want for your home or business. Our collections coordinate from room-to-room, or let you mix and match from wall-to-ceiling. And each fixture is designed to deliver a stunning quality of light that makes your space more beautiful and more livable. As one of the largest, privately held residential lighting fixture companies in North America, we're constantly working to create innovative and on-trend decorative products as well as knowledgeable support. Since 1938, we've been creating products that are not only well designed, but also practical. We invest millions of dollars each year in design, technology and testing to assure that we're offering distributors, designers, installers and homeowners not only innovative technologies - but also fixtures that perform efficiently, install intuitively and deliver a premium source of light. This philosophy holds true for everything we create - from our wide variety of decorative fixtures to our award-winning landscape lighting to our ceiling fans. Dimensions 8.0 In. X 30.0 In. X 8.0 In. These light for the price was placed in bathroom in entryway. I added an oval Tahari mirror that pops off wall that can me be around with the nice cashmere paint it looks classic. Would recommend to anyone who is looking to replace carpentry fixtures. The lights were perfect for my master bathroom! Good value, looks nice. We put it in a bathroom for a rental home. Best Wall Sconce for Your Living Room from Overstock.com. Find the best wall sconce for your living room with the help of these tips.